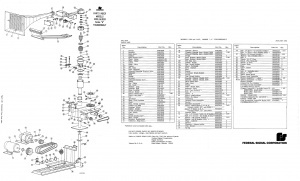 An exploded view and parts list of the Thunderbolt. 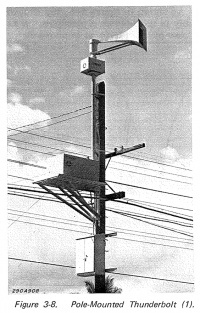 The Thunderbolt siren was a supercharged electromechanical siren produced by Federal Enterprises, which later became known as Federal Sign & Signal, and finally Federal Signal. The Thunderbolt has seven chopper levels, or voltage settings, that allow the pitch to be adjusted on the chopper, which gave the benefit to use lower or higher tones depending on the terrain and surroundings. The Thunderbolt can come in three port ratios, 5 Port single tone, or 4/5, and 5/6 Port dual tone. 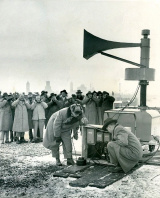 This siren was invented in the late 40s/early 50s as a cold war siren to warn the public of an air raid attack, later to be reissued as a multi-purpose disaster siren for weather, chemical spills, fires, or anything else that may deem appropriate. This siren went through many changes throughout it's life, and made quite a reputation as one of the best sirens in the market. The Thunderbolt 1000 is a single-tone siren. The 1000's chopper has 5 ports. The rotor is the same as that used in the Model 2, as well as the same motor. In retrospect, the Thunderbolt is said by some to be a Model 2 with a horn and a blower which it essentially is. The chopper is little more than a Model 2-240 with the legs, stator ring, stator, and intake cone removed and the stator replaced with a chopper cap, which was a mostly enclosed item with a single port that connected to the back of the Thunderbolt's horn via. allen screws. The rounded rotator pre production models of this siren built were single toned sirens as well. This model was the first model, but was later optional; 1000 being the only model from 1952-1953, optional from 1954-1990. The Thunderbolt 1000T is a dual-toned siren. The 1000T came in 4/5 or 5/6 port ratios, which correspond to minor 3rd and major 3rd intervals, respectively. The Thunderbolt 1003 uses two solenoids that are attached to the throat of the horn. Each solenoid has a gate that closes off one row of ports on the stator. They are used to create alternating steady, alternating wail, pulsed steady, and pulsed wail signals, which can be used as a fire warning. Otherwise, it is identical to the 1000T, but used the 5/6 rotor only. Although the 4/5 port rotor is compatible, it was never offered originally. The 1003 entered production around 1959, and ceased in 1990. It is noteworthy that the 1003 was the last production unit ever built. The last sirens went to a township in Michigan, however all of them were removed and replaced around 2009. The engine for a Thunderbolt 2000. Unit was converted to propane. The Thunderbolt 2000 is a variant from the 1950s with a blower powered by a gasoline engine. This unit was offered in single tone and dual tone. The blower was powered by a two cylinder, two stroke Wisconsin (likely air cooled) engine. 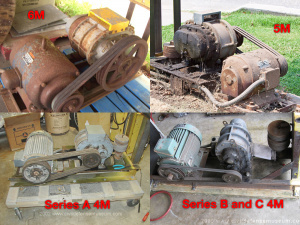 The blower size can be implied to be a 6MC size, as the 2000s were built solely in the 1950s, with the 5M only coming out in the very late 1950s (Ca. 1959), thus making the possibility of 5M 2000s either anachronistic, or a parts swap job if any exist. Some cities ended up with some, notably the outskirts of Los Angeles, and Phoenix Arizona. Units also existed in Florida and Detroit, MI. Only one 2000 stands today in Los Angeles, CA. Some 2000s are in private possession in Phoenix, Arizona as well. The Thunderbolt went through many different changes throughout it's prototypical phase. These prototypes included such units as ones with rounded horns, rounded blower and rotator enclosures, even non-rotational ones. The rounded rotator and blower unit is the unit that appears on very early Federal advertisements. One unit turned up in photos from a siren study in Jefferson City, Missouri. Another unit was supposedly destroyed in the Trinity nuclear test in the early 50s. 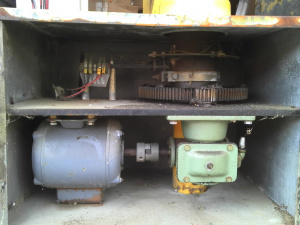 A person claimed to have found the remains of a rounded Thunderbolt rotator panel on a former test site, however no evidence ever surfaced to back this. It could be implied that the poster lied or was mistaken on his find. One other prototype unit turned up in photos that appears to have an oblong rotator. This unit was tested in Minneapolis, MN in early 1952. To this day, it is presumed that none of the prototype Thunderbolts survived into the 21st century. Originally the Thunderbolt used a motor and an Abart gear reducer driven by pulley to drive the large spur gear which makes the projector rotate. The pulleys utilized 3 different belt slots to change the RPM in which the siren rotates, from 2, 4, and 8 RPM. In the 80s Federal wanted to make the Thunderbolt more maintenance free, doing so by turning the motor and gear reducer to face each other and attached to make a direct drive system which rotated at 4 RPM. This rotator was used only on the B-series models. Later at the end of the Thunderbolt's life, Federal tried one more time to make the Thunderbolt better by designing an even better rotation system that would surpass the B-series model. The idea was to make it compact, and efficient. Think of it as a B-series, but in the shape of a cube, with a more reliable and low maintenance gear reducer, also keeping the collector rings in the chopper tube and not inside the rotator. This rotator was only featured on the last Thunderbolt model in 1993, and made it's appearance again on the 2001-SRNB, now used on the latest 2001-130, Equinox, and 508 sirens from Federal. All Thunderbolts run on what is known as a "blower" to push air to the top of the siren to increase sound output. 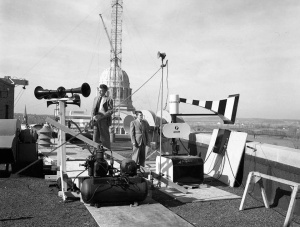 The type of blower was changed during production; starting in 1952, Thunderbolts used a 6M, then switched to the 5M blower around 1958, later to the 4M in 1965. This was used up until 1980, when Thunderbolts started to have the 4M roots blower mounted vertically, which was used all the way up to the end of its production in 1990. The units consisted of a motor and a Sutorbilt roots blower unit that was driven by belt pulleys attached to the blower and motor. The blower then took in air and pushed it into the pipes. They also had a "relief valve" that was mounted right outside of the roots blower, this acted as a "jam protection" system that would open if something was stuck in the standpipe. If something was stuck inside, air pressure would build up and would lift the relief valve open and let the air escape before the blower either, perforated the standpipe, blew off the chopper in the siren, or possibly cause the blower to literally explode. A notable feature of some Thunderbolts is their projector, or "horn". The earliest Thunderbolts had metal cross support bars, now referred to as "Jailbars", throughout the horn making a 3x3 grid in the front, 2x2 in the middle, and 2x2 in the back. This acted like reinforcements. Since the Thunderbolt was new at the time, Federal wanted to make sure the horn did not warp or bend as this would ruin the sound output. After 1952, Federal started testing to see if there really was any benefit from having these "supports" in the projector, this caused some models to have them, and some to lack them. After 1954, it became obvious that the thick metal panels used for the projector were strong enough to not compromise the projector itself. Federal decided to drop the reinforced projectors and continue making the models with nothing more than a mesh screen used to keep various animals, insects, and debris out so the rotor wouldn't lock up leading to a burnt motor. Approximately 50 of the reinforced projectors still exist to this day. Some Thunderbolts were adapted for other purposes as well. For instance, two units were adapted for train horns, by means of removing the rotator, and adding a custom flat projector as opposed to the regular Thunderbolt horn. It is unknown if these units had blowers or not. 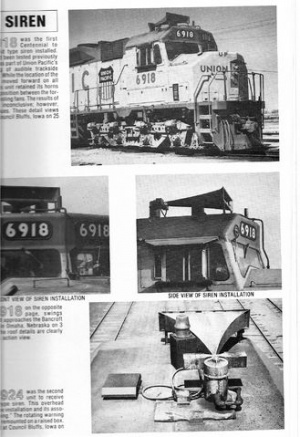 This setup was two Union Pacific Centennial engines; numbers 6918 and 6924 specifically. The setups were installed in roughly Mid-1979, and were gone by 1984. None of the two units are believed to still exist to this day. Both engines are still in service as of 2017. Thunderbolt 1000AT test in Memphis, Tennessee. This page was last edited on 21 March 2019, at 17:33.